In an era disgusted with politicians and the various instruments of "direct democracy," Walter Lippmann's The Phantom Public remains as relevant as ever. It reveals Lippmann at a time when he was most critical of the ills of American democracy. Antipopulist in sentiment, this volume defends elitism as a serious and distinctive intellectual option, one with considerable precursors in the American past. 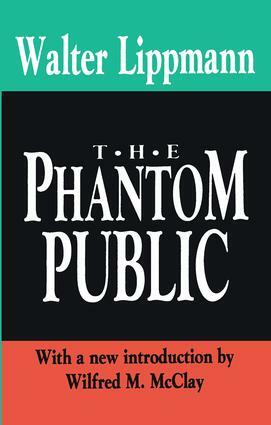 Lippmann's demythologized view of the American system of government resonates today.The Phantom Public discusses the "disenchanted man" who has become disillusioned not only with democracy, but also with reform. According to Lippmann, the average voter is incapable of governance; what is called the public is merely a "phantom." In terms of policy-making, the distinction should not be experts versus amateurs, but insiders versus outsiders. Lippmann challenges the core assumption of Progressive politics as well as any theory that pretends to leave political decision making in the hands of the people as a whole.In his biography Walter Lippmann and the American Century, Ronald Steel praised The Phantom Public as "one of Lippmann's most powerfully argued and revealing books. In it he came fully to terms with the inadequacy of traditional democratic theory." This volume is part of a continuing series on the major works of Walter Lippmann. As more and more Americans are inclined to become apathetic to the political system, this classic will be essential reading for students, teachers, and researchers of political science and history.